Nature’s Sunshine AnxiousLess alleviates worry, tension, and anxiousness. The formula contains the South African herb sceletium tortuosum and other nutrients that soothe stressed nerves and calm an anxious mind. 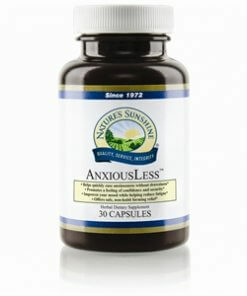 AnxiousLess is fast-acting and does not cause drowsiness. It enhances mood and helps relieve fatigue.